Northshore Coins and Collectibles purchases old coins, paper money, tin toys, military collectibles, odd and curious items. We buy Canadian currency such as pennies, 5 cent pieces, dimes, quarters, fifty cents, dollars prior to 1968. We are also interested in old American coins. We also purchase various other coins such as foreign, tokens, Olympic coins, medallions, proof sets. We will also pay cash for old Canadian and American bank notes, along with select foreign notes. Old steel, tin, and cast iron toys from brands such as Structo, Buddy L, Dinky, Marks, Lionell and most other metal toys in good condition prior to 1967. 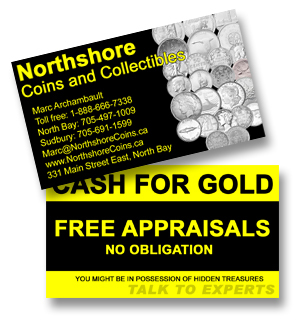 Northshore Coins & Collectibles purchases coins, currencies from all of Canadian provinces such as Ontario, Québec, British Columbia, Alberta, Manitoba, New Brunswick, Nova Scotia, Prince Edward Island, Newfoundland and Labrador, Saskatchewan, Northwest Territories, Nunavut, and Yukon. Locally we purchase Canadian and American - United States coins from North Bay, Greater Sudbury, Sturgeon Falls, Nipissing, Mattawa, Huntsville, Marten River, Sundridge, Temagami, Nobel, Muskoka, Alban, Espanola, French River, Blezard Valley, Capreol, Chelmsford, Copper Cliff, Coniston, Dowling, Hanmer, Lively, Onaping, Skead, Val Caron, Val Therese, Wahnapitae, Whitefish, Worthington, Noelville, St. Charles, Webwood, New Liskeard, Verner, Warren, Cache Bay, Astorville, Ontario. All Rights Reserved Worldwide. Copyright © 2015 Northshore Coins and Collectibles and Northshore Developments.